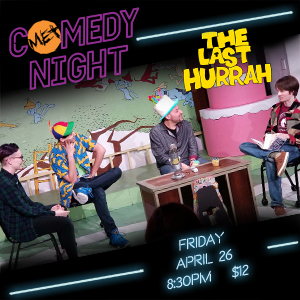 Running through MET’s 2018-2019 season, MET Comedy Night is bringing your favorite improvisers to the stage every Friday at 8:30 PM. 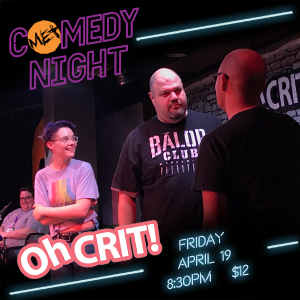 Catch performances from The Comedy Pigs, Oh Crit!, The Last Hurrah and a plethora of guest groups from all over Maryland for only $12. If it’s Friday night and you’re in need of a good laugh, then look no further than Maryland Ensemble Theatre. Roll for initiative! Improv comedy fused with Dungeons & Dragons! Join us as we embark on an adventure of twists and turns, bizarre characters, and occasional epic failure… All with the help from YOU and the whim of an unforgiving 20-sided die! Join their quest on the third Friday of every month. Click here to learn more about Oh Crit! Join The Last Hurrah on the fourth Friday of every month for a wild off-the-cuff talk show featuring Kevin Cole, Thom Huenger, IO Duarte, and surprise guests. Each month these ding-dongs make the best of the world around them, create slam poetry and who knows what else! Click here to learn more about The Last Hurrah. Performing for over 25 years, The Comedy Pigs are the region’s longest running improv troupe, and they’re ready for another great season. Join them on the first Friday and Saturday of every month for hilarious shows filled with a series of fun short form improv games. No two shows are ever the same, so be sure to join them each and every month! Click here to learn more about The Comedy Pigs.